It’s definitely been a game of two halves today, with this afternoon absolutely blissful, and this morning rather less so. I am finding that where there aren’t local train services linking towns on the coast (as there were in the south east) it is complicated and expensive to use the car, as I have to get a bus (few and far between) or a taxi (ruinously expensive). I therefore decided to try walking with enough stuff in my pack for a long weekend. Of course, I have walked with enough gear for a week in Wales and on the West Highland Way, but I was a good deal younger then, though maybe not fitter. Anyway, I decided to give it a try this weekend, so with my shiny new backpack (see equipment section if you are interested in the minutiae of packs and packing) I leapt on the train at Liverpool Street, to be decanted at Lowestoft at around 7.45 last night. My B&B was only five minutes’ walk (see review). I set out at 8.30 sharp, and retraced about a hundred yards that I had done last time. Lowestoft is not beguiling, and the wind was, if not howling, at least moaning. The first few miles were along the sea wall. 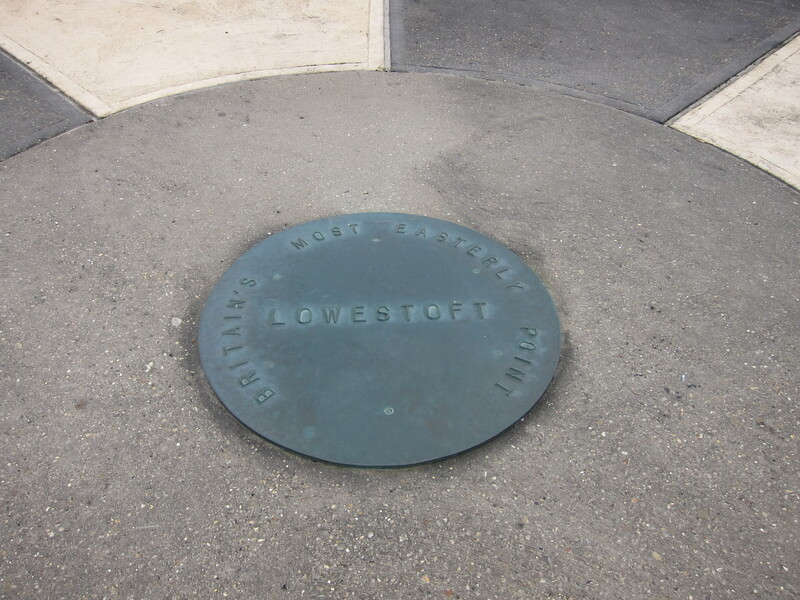 In due course, I came to Lowestoft Ness, which makes this a red letter day, as that is the most easterly point in Britain. I have done the most south easterly (South Foreland) and should bag the most south westerly later in the summer. The sky loured, but it didn’t actually rain. At the beginning, walking along the sea wall was fine, but it began to get narrower and more slippery as it went on, with warnings about using the path at one’s own risk, and a few places where the waves came right up and crashed over the path in front of me. The sea wall and cliff paths have been badly damaged by the last couple of winters’ storms and I eventually had to go inland to make a long and very frustrating detour through a caravan site. Not because it was further, but because all of the paths and roads seem to go round on circles with no exit. Eventually, I emerged onto a golf course at Gorleston. I could see Gorleston point and Great Yarmouth inland of it. Great Yarmouth is no more appealing than Lowestoft. Both towns seem very poor and there was an air of deprivation about the whole place. I walked up the west bank of the Yare amidst light industry and deserted coastal type buildings, to cross the river some two miles inland. Were I a purist, I would have walked right down to Gorleston Point on the east bank of the Yare, but I’m not, so I didn’t. Today was market day and the town square in was very full. I walked through it stopping in Boots to replace my toothbrush. In the interests of packing light I had a tiny travel one with me, but it more or less disintegrated and left me with a mouth full of bristles this morning, which was quite horrible, so be warned, and do not economise on tooth brushes. Down on the sea front again, at Scroby Sands the scenery improved over the dunes, towards Caistor, which still has the remains of its Roman fort. I saw a couple of chaps thatching a sea side shelter. 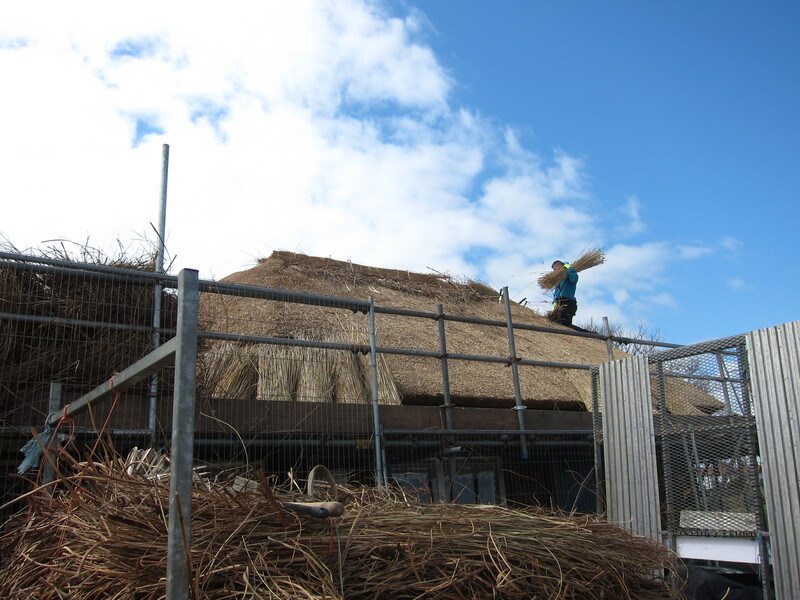 I have never seen thatching actually being done before. It looked like hard work – balancing whilst handling armfuls of reeds, about 3 – 4ft long. Out at sea I could see the Scroby wind farm. As I have said before, I think, I rather like off shore wind farms. Once I passed Caistor, I walked along the beach, and this is where the afternoon triumphed. The beach was superb; a long, flat stretch of firm golden sands as far as the eye could see. The sun had more or less emerged and the wind had dropped so that the sea was a vast expanse of blue with a fringe of white. On this day last year I put my feet in the water for the first time, and I decided to do the same today. It was marvellously refreshing, but achingly cold. Nicer under foot than the pebbles at Chichester harbour had been. I was not tempted to do more than stand in it for twenty seconds before putting the boots back on. 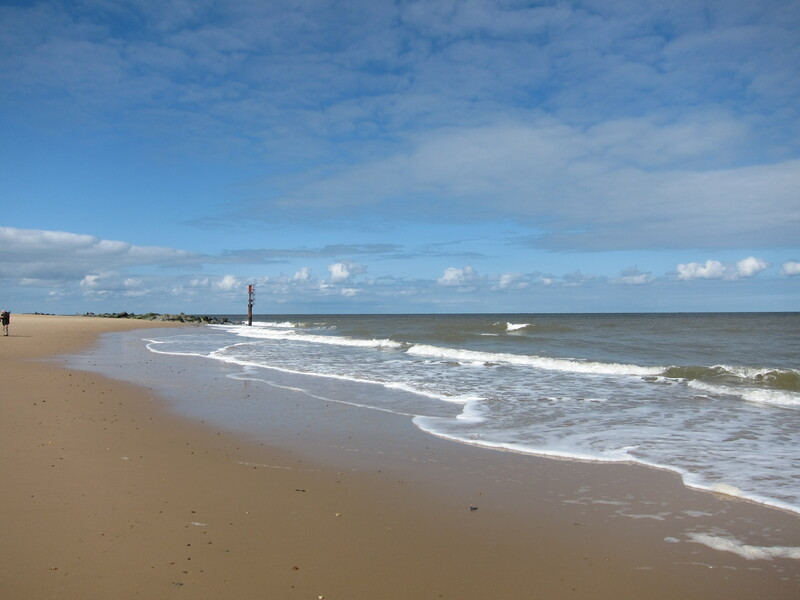 I walked along this magnificent stretch of coast for some eight miles to Winterton-on-Sea, a quiet fishing village with a very pleasant atmosphere (and a lot of adders!) I am now sitting sipping a cuppa in the Fisherman’s Return (see review) having covered 20.25 miles.